Taber Fire Department’s new ladder truck was officially unveiled at a ceremony outside the fire hall last week. The ceremony celebrated the history of the Taber Fire Department which has been around since July 1907. In those early days, two chemical tanks were purchased with a tank put on both the north and south sides of town. The tanks were pushed by manpower. In 1908, the fire hall was moved to the administration building where administration, police, and fire were all housed. The bell at the top of the administration building signaled to firefighters, with the most spectacular fire in the early days was the one at the Douglas building, which started in the basement, on a cold January night that hovered around -30 Celsius. The huge fire prompted town council in 1910 to build a water system to supply water within the downtown core. In 1912, a fire wagon and horses were added to the fire department. One of the earliest fire chiefs in Taber’s history, Robert (Cappy) Faulds, also served as police chief and town superintendent. In 1918, the horses were put out to pasture and replaced with a Dodge truck to power the department. In the early days, most of the heating and cooking was done by coal or wood stoves, resulting in a large number of chimney fires. “The only equipment that was needed at the time was a large ladder and a bag full of salt. To deal with any of the grass fires, all they needed was a water barrel attached to a truck and a burlap sack to go out and fight the fires,” said Munshaw. In 1920, Cappy and his volunteers staged the very first Fireman’s Ball. Money raised purchased boots, coats and Christmas hampers for the needy. In 1938, while in the line of duty, Robert (Cappy) Faulds was carrying oxygen bottles upstairs to a doctor’s office, and suffered a massive heart attack. Two days later, he passed away, marking Taber’s first line-of-duty death with the fire department. “In Cappy’s years, there were over 198 fire calls that his personnel was put to service,” said Munshaw. The fire bell was replaced with a siren to announce further to get firefighters to fires faster. In 1940, the first official fire truck was put into play for Taber. “From 111 years, we have been brought up from a horse-drawn chemical tank to this beautiful apparatus put before us,” said Munshaw. Part of the unveiling was a bell ceremony put on by the honour guard, where 36 names were dedicated to the bell of who have passed away and gave 10 or more years of service in Taber. They included: Robert (Cappy) Faulds, Angus McKay, Slim Jahrens, Earl Phillips, Art Catton, Jay Edwards, William (Bill) Lord, John Malinsky, Peter Lindquist, Robert Anderson, Bob Paterson, Ray Hackett, William Parks, Tommy Turner and George Fong. Other names included: Mike Rachwalski, Jimmy Bell, Art Kerkhoff, Jack Browning, Hubert Pyne, George Nessman, Bill Malinsky, Don Harding, Leo McCartee, Bud MacMurchy, Jack Goruk, Donald Jensen, Nick Malinsky, Harold Turnbull, Koji Kadonaga, Walter Stone, Frank Martens, Allan Friesen, Walter Karren, Ken Bullock and Terry Flexhaug. The bell was rang three times, times three to signify they have come home and their last call is finished. Family members were on hand at the ceremony for the dedication. “This will mark the first bell into Taber since 1940. The significance of the bell was to let firefighters know the fire was in town and whereabouts to go,” said Munshaw. 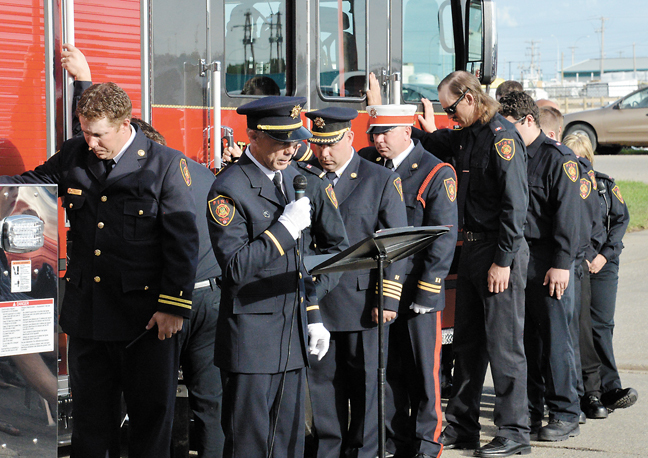 Taber Fire Department’s chaplain Clarence Bos recited the prayer of A.W. ‘Smokey’ Linn, who wrote the prayer in 1958 after witnessing the death of three young children in a house fire, and wrote the poem in helping deal with the grief. Bos would also bless the fire department and the resources it uses. The event ended with a hauling ceremony where members of the Taber Fire Department helped push the ladder truck back into the fire hall to start its service career. Back in late September 2017, town council voted unanimously to award the purchase of the platform fire truck to Commercial Truck Equipment Co. with the amount not to exceed $1,199,147.47, exclusive of GST; and supported transferring an additional $300,000 from capital reserves to offset the already budgeted $900,000 for the item.